What is an EMP and how does it work? An Electromagnetic Pulse (EMP) is a burst of electromagnetic radiation resulting from large explosions , especially nuclear explosions, or from a magnetic field fluctuation. EMPs can produce damaging current and voltage surges within electrical systems. 2. CME – Coronal Mass Ejection from a solar flare creating rapidly changing electric and magnetic fields in Earth’s magnetic field. The first true tests of HEMP devices occurred in 1962, an event called Starfish Prime, when a 1.44 megaton nuclear device was detonated 250 miles above the surface of the Earth over the Pacific Ocean. This extremely small device (in today’s terms) knocked out streetlights and other electrical equipment in Hawaii, 898 miles away. In that same year the Soviet Union detonated a much smaller device (only 300 kilotons) in space over Kazakhstan. The resulting EMP was reported to be many times greater than that of the US tests over the Pacific Ocean due to the land mass below and the stronger magnetic fields in that specific area. According to scientists within the US government a large nuclear device detonated roughly 300 miles above Kansas could result in an EMP spanning the entire mass of the continental United States. 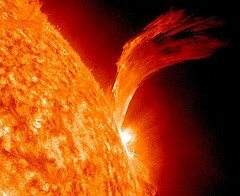 The first thing you need to know about a Coronal Mass Ejection (CME) is that not all Solar Flares result in a CME, and not all CME’s are the result of a Solar Flare. The most likely cause of a CME is a solar flare however, and on average, the larger the flare the larger the potential CME. CME’s occur quite often and even when they strike the Earth they cause little to no damage. That being said, a CME of large enough scale striking the Earth’s atmosphere could create the disruptions in the electric and magnetic fields of Earth similar to those created by a HEMP and potentially cause the Earth’s magnetic field to shift its alignment unpredictably. In 1859 an enormous CME caused what we now refer to as a Solar Superstorm. This event caused the northern lights to be seen as far south as Cuba and made compasses and telegraphs fail across the globe. The odds of an HEMP attack upon the United States are unknown, even though we can answer the question, what is an EMP and how does it work? Up until the recent past, very few nations had the capability of an attack, but as each year passes and the knowledge needed to complete such a mission becomes more available, the odds increase. Currently, China, Russia, North Korea, and likely, Iran, have sophisticated weapons that have been designed specifically to create an EMP. One likely scenario involving an EMP attack would be carried out by a terrorist element, such as ISIS or a similar, radical group. The odds of a massive CME striking the Earth are much more difficult to calculate. The easy odds are that the chances of it happening are 100%. It has happened before, it will happen again. The hard odds are whether or not it happens at a time when the human civilization cannot withstand it…like now. How do we protect our electronics from the effects of EMP? The easiest way to protect your devices from the effects of EMP is to construct a Faraday Cage. In simplistic terms you can build a Faraday Cage by constructing a metal container that can be closed relatively tightly. Inside this container you would install some form of insulating material such as Styrofoam. As long as the container closes relatively tightly and the insulating material covers all metal surfaces, any items inside the container are reasonably well protected from the effects of am EMP. When the EMP strikes the cage it will simply conduct itself around the metal exterior, not passing through the insulation to the devices inside. If the container is open, the EMP will certainly have a good chance of striking the items inside. Faraday Cages can be scaled up large enough to protect items as large as vehicles as long as proper insulation is used. A large metal shipping container insulated with several inches of Styrofoam insulation could easily protect hundreds or even thousands of small devices or many devices ranging in size. The effects of a massive CME striking the Earth vary among sources. As a prepper it is my inclination to prepare myself and my family for a worst case scenario. In a worst case scenario the handheld electronics you have protected in your Faraday Cages will most likely be the least of your worries. The moment a large EMP wipes out earthly electronics there will be massive death. Everyone utilizing any method of flight may suddenly find themselves falling to the earth. Although no hard numbers are available for how many people are in the air at any given moment, it is probably close to 1 million. At the same moment it is quite possible that all vehicles travelling will suddenly lose power. Many will not be able to brake or steer properly, creating massive casualties globally. Millions of people worldwide that depend on machines to perform life support functions will begin to perish within moments of the EMP. Immediately after the EMP the world’s supply chains are finished. Famine stricken areas around the world will have received their last shipment, drought stricken areas their last water. In the United States grocery stores will most likely have stocked their shelves for the last time and larger non-farming based communities will begin a rapid decline. In a matter of days the socio-economic societies of Earth will crumble and fail. Most estimates state that the loss of power would last weeks or months until power is restored. I don’t believe these estimates to be accurate and feel that with all of the other concerns that will be present, re-establishing power across the country will be low of the list. Begin your preparations now by becoming self-sufficient. Develop your own power sources via solar and wind power devices. Ensure you have all of the necessary knowledge and materials to repair these devices after an EMP and obviously ensure the spare parts are protected against EMP. Learn to live off of food that you have grown and processed animals you have hunted or bred for livestock. In other words you need to begin preparing now to do it on your own. Get a FREE copy of “The First 15 Things You Must Do Immediately After an EMP” via email, along with additional reports and special updates. Want to learn more about EMP via an entertaining novel? There are three sources of EMP – the one missing is lightening. These three sources produce three distinct types of EMP with some very different effects. E1 is a non-second scale burst of electrons from HEMP. E2 is a 500 ms to one second burst of electrons naturally produced by lightening. E3 is the hours to days scale bombardment of electrons from a CME or Geomagnetic Storm (which can be triggered by non-CME events …). So why is understanding all three types critical? The effect and protective measures are to a degree cumulative. So if you prepare for an E1 type EMP (HEMP) then E2 and E3 are also covered. Ditto E2 and E3. HEMP (nuclear blast 60 miles or higher) produces E1 and E2 effects. Lightening only produces E2 effects. CME/GMS produces some E2 but mostly E3 effects. In regards to this article, if you have equipment that has been protected against lightening strikes then you are also protected against CMEs and GMSs. During a CME the effect will primarily hit long lines — power, telephone (older copper infrastructure), large generator windings, etc. Line lengths need to be in the 10’s of miles to pick up a charge. This is similar to a ground voltage being produced during very cold, dry conditions. Where the impact occurs is in large three phase devices. Each phase is 120 degrees off of the other two. When you have very small (it turns out) additional current on one of the three phases you then throw that leg off and crash the entire device. Hence transformers, generators, etc. all get fried. Briefly, if you have a good grounding or surge protection system set up at home, you don’t have to worry about E3 EMP effects. Backup generators, solar panels, etc. should all continue to work. Treat it as if it were a regional power outage due to an ice storm for example, and you should be OK. The power distribution backbone will be trashed, but local systems should be OK.
E2 is what you get with lightening and outside the primary effect radius of a HEMP. Lightening protection we should all understand, especially those of us who own/use antennas. Lets move to HEMP now (E1 plus wider ranged E2). This is the only scenario under which you will need a Faraday cage. This is because E1 effects occur in nanoseconds or at best milliseconds after the blast. The good news is that the range of the E1 effects are limited. For large countries with advanced weapons/space programs (China, Russia, France, Britain, Israel, US, etc.) the optimal burst height is 100 km (edge of space) using a 20 megaton device (according to what I’ve read). This gives us an effective E1 radius of 700 or so miles. For example, a HEMP over Chicago would impact everything from roughly Ft. Pierre SD to North Platte Nebraska on the west, down to Hutchinson KS in the SW, the Arkansas – Louisiana border in the south, Jackson MS in the SE, DC and NY in the E, and just shy of Boston in the NE. With a HEMP, the E1 will fry most IC (integrated circuits) as well as larger equipment up to and including the large transformers and electrical engines used as overhead cranes in factories. Within the E1 zone, its the stone age. E2 effects will be felt anywhere within line of sight of the blast (apx. 1120 miles) but remember E2 is basically like a lightening strike. Normal surge protectors will guard against it most of the time. So what, we lose the liberal upper midwest you say. Well we also lose a good part of the electrical grid at the same time. There are three grids in the US – Eastern, Western, and Texas. The interconnects between them are DC (not AC) and control signals do not pass back and forth. What is key is a HEMP over the Eastern grid will basically destroy the Eastern grid. But it won’t destroy the Western or Texas grids. And the DC interconnects are far enough West and South that a HEMP over Chicago won’t take them out. Now for the “terrorist” attack (or Iranian HEMP which is more likely). Using a SCUD missile the max altitude that a SCUD can lift a payload is 40 kms or so – much lower than an more advanced missile can do. This reduces the radius of the E1 to 480 miles or so (using a 20 kt warhead which is about the max the SCUD can lift. Draw a circle around Chicago (I really don’t like Chicago do I?) that touches Omaha in the West, Nashville in the South, and Pittsburgh in the East. Sorry, Toronto has to go as well. This is the area where electronics will be destroyed (and the same Eastern grid will go as well, but not as much of it will be totally destroyed, merely offline for months). Why did I mention the likelihood of an Iranian attack? Because the supply ship Kharg and destroyer Shaid Qandi are either in Venezuela or Cuba depending on the week. And the Kharq is the same freighter that the Iranians used in the late 1990’s to test fire freighter launched SCUD missiles up in the Black Sea (buying the launchers and missiles from Russia at the time). What would a likely Iranian response be to an Israeli or US strike on their nuclear facilities? I.e. I don’t place the likelihood of HEMP as low as the author of the article does. Chicago was only used as an example … I do point out though that the St. Lawrence Seaway is considered to be international waters hence until war is declared, the Iranians are free to transit it. I’d agree something much further south and east … Houston, Atlanta, and DC all probably make easier targets and you still disrupt the entire eastern grid (or Texas and the Eastern grid). I’m still trying to figure out how to protect my digital key pad on my gun safe. I can’t afford to switch it to a manual lock. Any suggestions? My husband and I have been Hurricane Prepping for a while.. Concerned over SHTF we have extended our food, clothing, medical supplies etc.at this point to six months or so.. to include our daughter and our 12 month granddaughter. I read an article on the Internet… ( Getting Prepared for an Electromagnetic Pulse Attack or Severe Storm) by Jerry Emanuelson and decided to use some of his ideas to store small electronics such as DC fans, DC TV, CB radios, small solar panel with controller, batteries, and chargers. If we don’t have an EMP it makes a great protective storage container in case of hurricanes. The Farraday Cage we are using to store the small electronics is a 20 gallon Galvanized Garbage Can lined with cardboard. There is a video on the Internet that shows how to make and test it using an FM radio. We also bought large ammo cans, a suggestion from a survival blog, lined them with cardboard to store a small CCrane radio that has AM, FM, Weather, and Ham bands, a CCrane Base Walkie Talkie with radio bands, and two small Walkie Talkies with batteries. In a second ammo can we have our emergency lights-LED “head” lights and LED flashlights with batteries and DC charger. Again, great storage for hurricane or EMP.. and easily carried if you have to GOOD.. I am still concerned about EMP damage to our backup generator and have considered some type of Farraday cage for it . Working on an idea of aluminum screen. Maybe someone else might have a few suggestions there. A cme and emp will destroy the main components (transformes) to our electrical grid. The are large and hard to replace. Expensive too. They are also made in china now days. IF they are willing to make them for us it will take months to make and get installed. Millions will die in the mean time. I UNDERSTAND YOUR A WOMAN.I AM GOING TO ONLY GONG TO SAY THIS ONE TIME, WHAT YOU DONT UNDERSTAND THAT RUSSIA AND CHINA WILL INVADE U.S AND TAKE OVER. OUR POOR EXCUSE FOR PRESIDENT OBAMA IS ON THIER SIDE! Assuming the electric grid was damaged it can be repaired. It is unlikely that an EMP would destroy a transformer because the amount of short term energy necessary to do that would burn out one of the many weak links and fuses before the transformer overloaded. But if a transformer is destroyed repairing it is actually easy and even local utility companies could do this. Even in a worst case scenario electricity could be restored to critical systems in a matter of days to weeks and then to everyone within urban areas within weeks to months. But it is probable that even the most powerful EMP will not impact most of the grid or most of the electronics. It is a very hit or miss device easily blocked by geographic features and terrain. And the power of an electronic pulse decreases rapidly over distance (inverse square law) and it is likely that even 50 -300 miles from an EMP device it may not be powerful enough to destroy anything. This is an over rated threat. In fact an enemy would be incredibly stupid to attack the U.S. with an EMP device. It would only piss us off. It is an act of war. and it is a nuclear attack which would provoke a nuclear response. Just wondering, Gone, what is the source of your information ?.. Education background, Work Experience..
1. The small transformers you see hanging on utility poles outside your home. These are easily portable to bring back to the local shop to be repaired. This is not generally done today because it is easier and cheaper to send them back to the manufacturer and replace with a new or rebuilt. 2. The much larger transformers you see at substations behind chain link fences. These transformers can also be rebuilt by local utility workers but again they are not because it is again easier and cheaper to R&R them. 3. The very large high voltage transfomers that feed the high voltage power lines. These are typically found at the power generation source; dams, power stations, etc. They are very robust and the least likely to be damaged by an EMT or any cause. They too “could” be rebuilt or repaired in situ. Understand that all of these class of transformers use such heavy copper wire or strap for their windings that it is not fine detail work and breaks in the windings could be repaired using existing older technologies every utility has avaible to them. 4. The ultra high voltage transformers used in a very few power generation plants in the U.S. These are very large and more complex then the other three classes of transfomers. Arguably a team of skilled workers could indeed repair or rebuild one of these in situ but it would be a bigger task then the smaller transfomers. There aren’t a lot of these in the U.S., perhaps less the 50. They are expensive and difficult to transport. I don’t think these transformers are the future of electricity distribution and we may not install many more in the future. Every electric distributiion network has multiple fuses and weak links distributed throughout the system. In the event of an EMP that was strong enough to burn out a large heavy duty transformer it would first sever the line at one of these points. keep in mind that these transformers are designed to be heavily loaded for long periods of time. Where delicate or even military level of electronics is designed to handle a few hundred watts typically or a few thousand at most. The transfomers in the electric distribution system are designed to handle HUGE loads into the Megawatts or easily millions of times more power then circuitry we are familiar with around the home, office or military. They very rarely ever “burn out” and then ONLY as a result of a very long overload and certainly not from a short transitory pulse such as an EMP. It would be a big deal to someone on life support or seriously ill in a hospital. It could also be life threatening for some people in bad weather etc. It would certainly be an inconvenience for everyone until power was restored. And it would take a long time to get back to 100%. The “big deal” would be the military threat. There is no practical way to create a large EMP except with a nuclear device and thus it would be a nuclear attack against the U.S. This would not be treated lightly and would probably result in a nuclear response of some kind. Its always good to be able to glean more information on a topic that is being discussed by many at this time. GoneWithTheWind… Unfortunately, it’s not like the old days anymore. The definition of enemy has dramatically changed over the last 50 years. If North America gets hit by an EMP it will most likely be pinned on a small extremist group or individual despot who will retreat into hiding. A nuclear counterstrike response would almost certainly target the wrong people and is therefore no longer a sufficient deterrent. I think that to call this an “over rated threat” is to deny certain social and political trending evidences. It’s always best not to get caught unprepared. From what limited research I’ve done, it seems to me that there is quite a bit of disagreement on the amount of damage an EMP will cause. Some say it will fry any circuits, others say it will fry anything with a chip, while others say the devastation will be far less than total for electronics. Still, I go with worst case scenario. I’ve been wrapping my surplus electronics with aluminum foil and taping the edges with metal tape. You’re right, Rob. An EMP on the scale that many of us imagine has never happened and it’s impossible to extrapolate a whole lot from the limited number that have occurred. I wrote about EMP in my book and offered suggestions to prepare, but there’s no doubt that Americans would suffer far beyond what most of us could imagine. Every nuclear device can be traced back to it’s country of origin by it’s radioactive and chemical signature. The methodology is accurate enough to even determine, in many cases, a time period in which the device was built. If an EMP (or any nuclear device) were detonated in the U.S. within a week we would know where it was built, about when it was built and if it was transferred to someone who did it and who received it. Most likely any device available to terrorists would have originated from Russia, North Korea or Pakistan. Your point is valid, If Russia was the original source and not the country that depployed it what could we do to Russia. However if Iran backed the terrorist group that did actually deploy the device I’m guessing we would nuke Iran. Is this good or bad, right or wrong? Doesn’t matter, 300 million people would demand it and no politician would oppose it. If someone sets off a nuke here then they will get ten more back. Here is another resource with info and practical ideas for preparation. both proactive and post event. “One Second After” last month. Oh my goodness! While it is a work of fiction, it made me think about how crazy things could get if a major crisis were to occur. Gone with the Wind — HEMP from a nuclear source is subject to the inverse square law however CME/GMS operate more off of an electron cascade than direct impingement. E2 is a combination of the two … optimal HEMP is 20 megatons at 100 kms altitude, SCUD type HEMP is 10 – 20 kt at 40 kms of altitude. Big difference. Yet the interconnectedness of the grid and the SCADA controls make it such that any major disruption in the Eastern grid will take out the Eastern grid (either trip or damage) ditto the Texas and Western. Each type of EMP (different sources) has different pluses and minuses. Worst case though is something that nails three phase power from long distance — then the major transformers and the major electrical (industrial) components are toast due to the imbalances in the loads on the three phases. When we tested some transformers we found that as little as a 2% imbalance would not just trip the transformer, but destroy it. And you can get that imbalance over the entire grid. Best case is that you lose the backbone, but not the single phase feeders except in an area directly under the HEMP (400-700 mile radius of the blast with the normal distortions for electron flow along the geomagnetic lines). A CME is something we cannot control. However we have had examples of CME recently with zero effects. Certainly it is possible that a much larger event will someday take place. The HEMP is of course what we are talking about. Can you imagine a scenario where Russia or China or anyone sets off a 20 megaton nuclear bomb over our country and we do nothing? Who would be that stupid? Certainly not Russia or China. If they decide to attack us in a nuclear armegeddon they will use about 4000 nukes not one. Could terrorists get a 20 megaton nuke and deliver it 100 kms above Kansas? Of course not. So the odds are greater that the sun will explode then someone will set off a single enormous nuke above our country. But the good news is IF someone does set of a nuke/HEMP over Kansas it will probably affect less then 25 % of our grid and our existing utilities have the ability to fix it given a few weeks to a few months. Is that “ideal”? No, wouldn’t it be great if the grid was so strong that no HEMP could destroy it? But that is impossible because you simply cannot harden a system of wires out in the open sufficiently to prevent damage. So while you worry about a scenario that either cannot or will not happen that at best will affect less then 25% of our grid and cvan be repaired in weeks I prefer to worry about real risks (and there are many). Can anyone, anywhere, tell me the certain duration of a CME? We can’t know, it’s a natural event! If the period of activity is for a few months, then we should leave everything in the Faraday boxes for…. how long…. or they will get zapped by the next flare. Of course, if we knew it was a HEMP then it would be easier to know when to get that stuff out of storage. Can you please list the recent CME’s we’ve had? And their strength on some scale that we can measure against say the Carrington event and the Ontario blackouts? Also, the supply ship Kharg and destroyer Shaid Qandi (Iranian Navy 18th flotilla) are on this side of the Atlantic. The Kharg was the vessel used by the Iranian Navy to test fire the shipping container (CONEX) SCUD launchers. As such it represents an asymmetric threat to the US, not hundreds of warheads. And again, in testing (not theoretical testing, field testing) it only took as little as a 2% imbalance in voltages in the three phases to physically destroy three phase transformers and motors. The imbalance created vibrational instabilities that tore the rotor/windings apart after a short time. So while I agree that the most damage will be tripped transformers and fuses, there will be a significant portion of the impacted grid that will go down hard. Medium sized three phase transformers are produced at around 100 per month with a minimum 30 day lead time. These are the pad mounted ones you see outside office buildings and the like. Currently I can find 62 substation transformers (10 MVA or higher) in inventory worldwide. And Power Grid International lists the average order to installation time for the backbone or substation transformers as 3–5 years. So the statement about being able to fix the grid in a few weeks or months is utter nonsense. gone with the wind your comment should be gone with the wind too. You are totally incorrect about the restoration process. yes the local transformers can be fixed locally but the main large transformers at the power plants cannot be replaced without getting replacements from CHINA and numerous other components are all from CHINA as was testified to congress in reference to this very subject. and they are extremely expensive and China would more than likely NOT replace them as we would be history as a nation anyways. We would collapse immediately in every sense economically militarily and every other structure that keeps us standing. We would immediately return to the early 1800’s as an infrastructure technically and there would be hundreds of millions dead within months. China would not invade nor would Russia because they would not want the responsibilities of feeding 350 million starving Americans with guns so they would wait until the death rate stopped and then come in and take our resources that were left ie oil gold etc and make us low wage workers til we die off. this was all testified to congress on numerous times as to how the scenario would play out. as for us retaliating well the odds are we would never know who launched if it was done from a local frigate off shore and it detonated about 200 miles about the country. It would wipe out ALL electronics from mexico to Canada east to west and nothing we could do to stop it. We do have very few military equipment protected but not much as of yet but they are working on it. “Gone” your trying to talk as if you are knowledgeable on the subject but for those of us that have studied in depth it is obvious either your uninformed or just making it up as you think it would be. either way is dangerous and you should educate yourself for real about this subject because your leading people astray from truth. and truth is what will save lives in the end. just in case you dont want to take my word for it simply go read the testimony in front of congress by the true experts that know much more than you ever thought of. and relayed by the congressman explaining that it would take up to 6 years or more to ever repair things which would be too late. there are many articles about it try these just to start. Very informative article/discussion. I have a question though and have found very little info on during my research. How will an EMP/Solar Storm effect a pacemaker? My husband had an “On-Demand”! Only kicks in if needed. And so far, as far as we know, it has never kicked in “As Needed”! Which just brought up an another interesting question. Can the “on-demand usage” be tracked/downloaded? He just went in the other day because it popped on for no know reason. Dr. just turned down the voltage. We were near a lot of aircraft electrical equipment and thought that may have had some effect. IDK! Anyway I would like your thoughts on this question. I have three faraday cages. One is a galvanized trash can with two layers of cardboard. The other is two medium sized wall lockers, like school with multiple shelves added in and a thick layer of cardboard. After reading thoughts here yesterday, rethinking the wall lockers. They have the open vents. Now thinking, seal those off with Air Conditioning tape? Yes/No? In my cages have, new mobile ham radio w/power supply(just got the antenna house set-up day before yesterday/ also have complete equipment for installation in vehicle, so set-up for house base station and vehicle); extra flashlights w/extra batteries; emergency battery/hand crank/ solar power radio that gets wx alerts from NOAA, “receives only” on ham channels, and built-in flashlight; two handheld ham radios w/chargers and vehicle antenna; various other electronics i.e. extra printer, flashdrives w/survival info, extra C-Pac machine for husband, etc. I have a large number of ammo cans, but rethinking that after what I read on another link on this site yesterday. Have various other metal “suitcase like containers” that are waiting to be finished off. There are a lot of unknowns when it comes to EMP and the effects of coronal mass ejections. However, the consensus is that most everything with an electronic component will be affected, and that would include electronic pacemakers. The wall lockers will not make effective Faraday cages because, as you mentioned, they are not fully and completely sealed. It sounds like you have put together a pretty impressive array of items, so be sure everything is as protected as possible. So you think the A/C tape will not solve problem? What about a welded plate over air slats? IDK, just thinking out loud. Would like to savage wall like idea as we have shelves set-up for radio equipment organization. Ideas? I have a hypothetical question. What would happen to these Extra High Voltage transformers that are sitting in warehouses around the world? I know there are only a few, but would a pulse affect them as well, since they are not “plugged in”, so to speak? So if there was a global emp (hypothetically of course), would humanity have to start from scratch and build new ones? Thank you in advance for any light shed on this. One other book you may want to add to your list is One Second After by William Forstchen. I think it paints a true, grim picture of how life would be after a worse case scenario EMP. I’m reading that book, again. It is a reality check. Another thing, did you know that FOX news has broadcast the location of the power sources for all the world to know? I know that we as Americans want to know, but now the whole world knows. I just read 2 books about the EMPs. Yes, they are fiction, but scarey to me. I’ve been waiting for the other shoe to drop since 9/11. I’m surprised it hasn’t dropped yet.